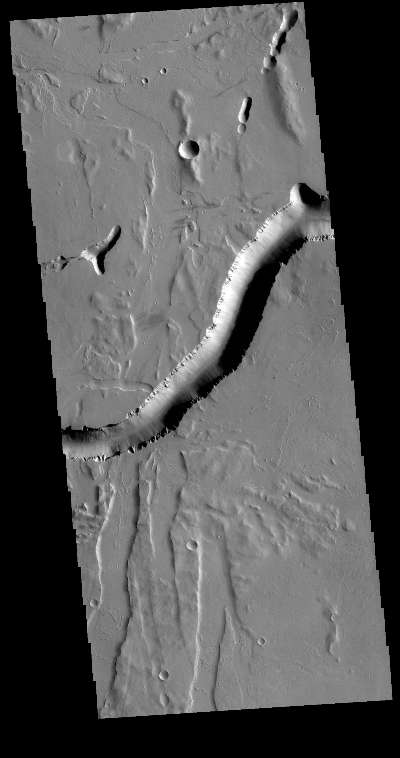 Olympica Fossae is a complex channel located on the volcanic plains between Alba Mons and Olympus Mons. The sinuosity of the large channel in the middle of the image indicates that this is a channel created by liquid flow. In this case the location and other surface features point to lava rather than water as the liquid. The more linear depressions at the bottom third of the image are possibly tectonic features called graben and formed by movement along fault lines. The Alba Mons region contains extensive faulting which formed due to collapse of the volcano.